What Networks Does BuzzFeed Actually Use? Among the most defining characteristics of BuzzFeed’s strategy is the way their content reaches readers: the vast majority is distributed through channels other than their website. The publication often cites the fact that their teams publish content to over 30 platforms, across 11 countries, in seven languages. This led us to ask which platforms are they actively using and what does this fragmented paradigm actually look like in practice. The answer wasn’t easy to find. After a few quick Google searches didn’t produce a list of distribution channels, we tried manually listing all of the networks we could think of and checking for official BuzzFeed properties, but still came up short. Instead, we reached out to BuzzFeed directly to understand where they are investing in distributing content. The list they shared had 45 different distribution channels, ranging from social networks to home-grown apps. 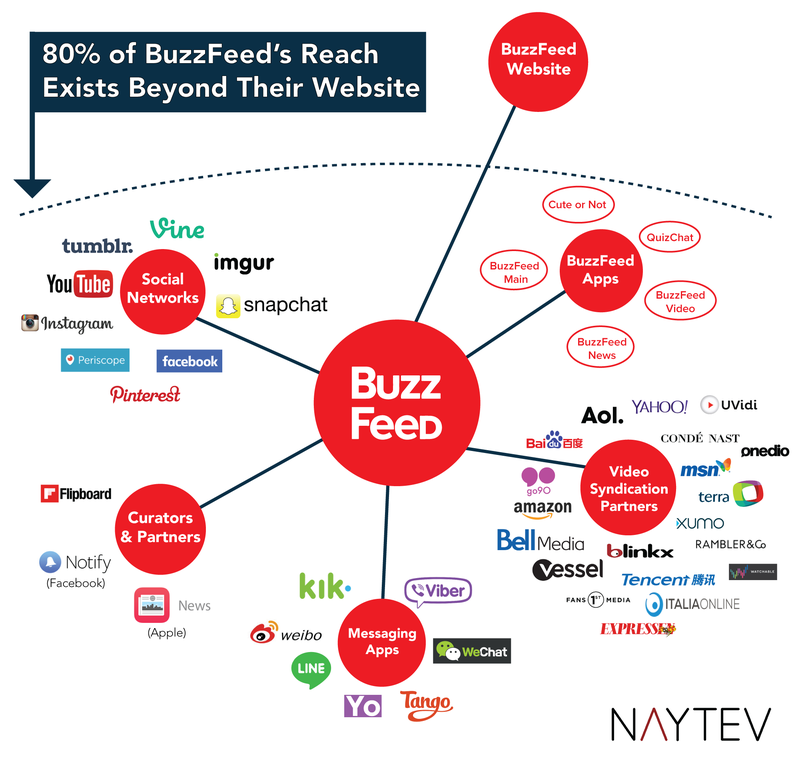 As BuzzFeed points out, over 80% of their reach exists beyond the bounds of their website. One thing that’s immediately evident is that BuzzFeed’s reach is far more diversified than most traditional media companies. Far from relying exclusively on their website, they’ve built a network with strong distribution on many different platforms and channel types. 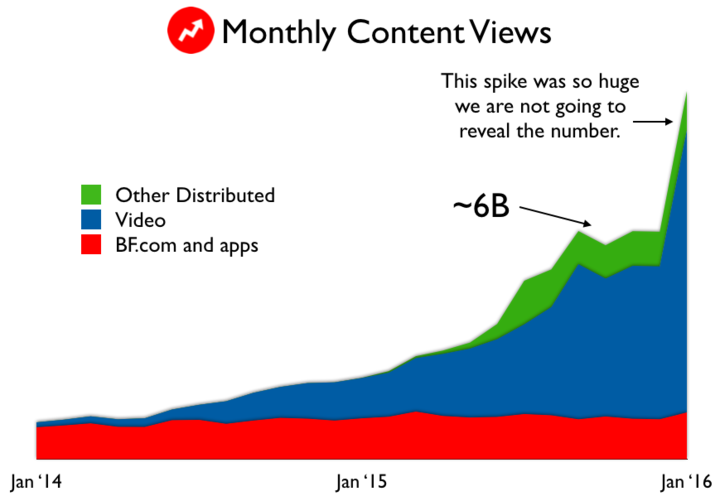 It’s also clear that from a sheer numbers perspective, video is a huge priority for BuzzFeed. Of the 45 distribution channels, nearly half are Video Syndication Partners. However, the number of video syndication partners alone doesn’t capture the scale of this part of their reach. Despite having only 200 million unique monthly visitors to their main website, BuzzFeed’s videos receive over 1 billion views every month. Video is also increasingly important to many social networks, so it’s likely distribution in this area will only continue to grow. We can also infer from the composition of the social networks BuzzFeed uses that their strategy extends beyond simply posting content to social feeds in the hope of enticing traffic back to the website. SnapChat, Imgur, Instagram, and Periscope do not drive referral traffic. However, they are all strong opportunities for audience engagement with content consumed directly on the network. This is only possible because BuzzFeed has decoupled monetization from website pageviews, a model which appears increasingly prescient as falling ad prices and the rise of ad blockers threaten the core advertising businesses of many traditional media companies. More content platforms (including Facebook, Google, and Twitter) are switching to a model where content is consumed in place rather than linking back to its source, and BuzzFeed has a significant headstart in surviving this shift. BuzzFeed’s distribution strategy is most interesting when considered in the context of this broader shift that media is experiencing. Publishers must look beyond the traditional bounds of their websites and give equal priority to the distributed parts of their audiences. Creating content for dozens of platforms, each with their own audience and personality, is certainly a complex challenge. However, it’s not only possible, but likely necessary for these media companies’ survival.